The Tourist Hotel is conveniently located within 50 metres from Levoberezhnaya metro station, just in 7 minutes from Khreshchatyk Street. The immediate proximity to the International Exhibition Centre makes the hotel convenient for visitors and exhibitors. 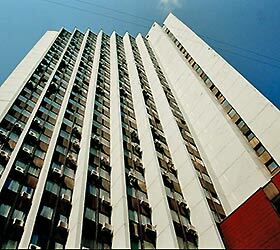 The hotel offers 332 rooms of different categories. In each room: bathroom, set of towels, branded toiletries, work area (desk), refrigerator, TV, telephone, Wi-Fi. An on-site restaurant can accommodate up to 500 people at the same time. The hotel has several conference halls for various events. There is a parking lot for guests.